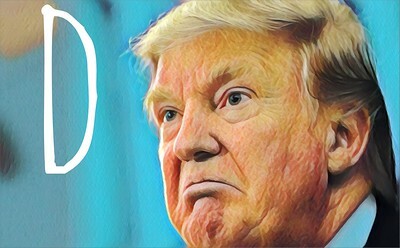 Last year about this time I started a series of anti-Trump posts based on the Devil’s Dictionary, where I would pick a letter for the day and a number of DD entries to slyly use as criticisms of that idiot. While it might have made me feel good it was totally useless as far as fixing the problem was concerned. After the letter J, I called a hiatus in early March. The reason then, as ever now, is because “the raging dumpster fire of a presidency” is still sucking the oxygen out of just about everything around it. Read that first third of the First Amendment over and over until it finally, if possible, sinks into that thick skull of yours. Ever heard of the phrase “freedom n individual unfit to run for public office, let alone be elected and serve. What’s scary about the special Alabama election that allowed Moore to run is that he nearly won. There were that many Alabama voters stupid enough to vote for him. Doug Jones didn’t win so much because Alabamans had an epiphany, it’s because many more Alabamans than usual voted, and it was those energized voters who voted against him. There’s a base of Republican idiots in Alabama and they came out in force for Moore, and it’s that base that’s still a threat to democracy in Alabama and the nation. This is the last time I’ll ever write about Trump, unless he winds up being impeached and forced from office. And while I think it’s possible to impeach him, getting him out before his four years are up is going to be just about impossible. Unless, like Nixon, Mueller finds enough evidence against him to charge and convict him of whatever. My blog is my corner of sanity where I can go and write about whatever I want, as long as it’s not about Trump and his brand of poisonous politics. I have a Twitter account for politics. And there are others out there on the web who like to write about the small fingered vulgarian and his industrial scale mendacity. It’s been quite a while since I last blogged about writing in Google’s Go. The language itself has evolved considerably over that period of time, but my skills in it have basically stood still. 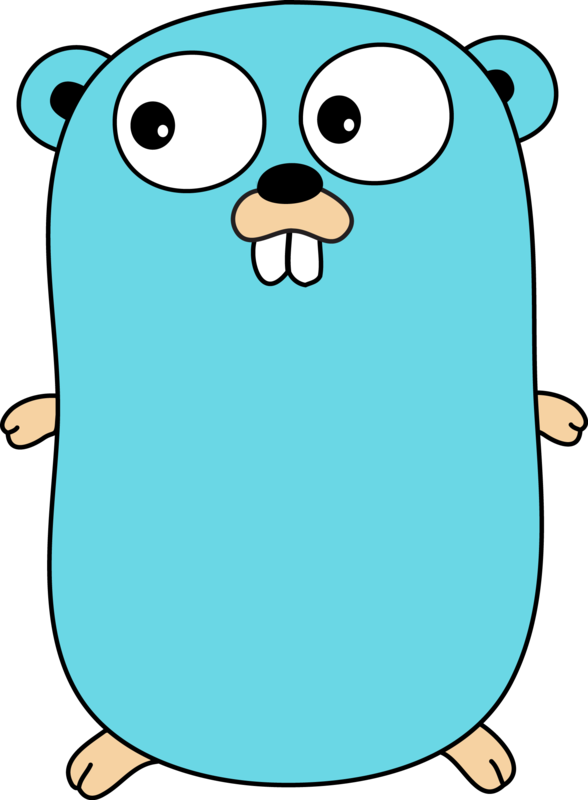 Go, however, has not, especially its use around today’s contemporary software environments, such as containers. It’s also available as a regular installable package on Arch ARM for the Raspberry Pi 2/3. I’ve been investigating network programming on the Raspberry Pi, looking for a minimalist set of tools that can provide robust connectivity and functionality. One of the tools I’ve been looking for is a web server or wiki. Turns out that there’s a Go tutorial that leads the reader through the steps necessary to create a minimal wiki. It’s located here: Writing Web Applications. Once I finished the tutorial I followed through with the suggested simple tasks at the bottom of the tutorial. One of them was the ability to add WiKi markup to create tags within the body of any page I created. I followed Help:Wikitext for syntax and to see how regular Wiki handles markup. I implemented very little: links, headers, single unordered lists, italic and bold text. I felt that was enough to get started, and it’s enough to drop onto a Raspberry Pi as a bare executable. There are a few more key features I’d like to add, such as table support, but that’s for another round of coding. Now, I’m taking a break while I go off and do other tasks. // Original Copyright 2010 The Go Authors. All rights reserved. // any of them, then I'm ready to learn. result = "<h6>" + s.TrimSpace(s.Trim(line, "=")) + "</h6>\n"
result = "<h5>" + s.TrimSpace(s.Trim(line, "=")) + "</h5>\n"
result = "<h4>" + s.TrimSpace(s.Trim(line, "=")) + "</h4>\n"
result = "<h3>" + s.TrimSpace(s.Trim(line, "=")) + "</h3>\n"
// If the page doesn't exist, then redirect to the editing function and create the page. // Break on the new line (\n) because that's common to both Windows/DOS and Unix and Unix-like editors. // We'll strip off any carriage returns (\r) as white space. // expandedBody is where all the displayable text with HTML decorations will be collected. // Strip all leading and trailing white space, including carriage returns (\r). // followed by a new line (\n). // Bold and italicize any marked text. Try to handle the mixing of both. return "<b>" + matched + "</b>"
return "<i>" + matched + "</i>"
// Create links from [[PageName]] pattern. // use the %20 called for in the standards, but I decided underscores were better. return "<a href=\"/view/" + s.Replace(matched, " ", "_", -1) + "\">" + matched + "</a>"
// Look for unordered lists. If we find an unordered list notation, then start building that list. // Look for headings and the rest of the document. // Rejoin all the lines we created with the initial split using he HTML break followed by a new line. Here’s a typical markup page. This is the front page. 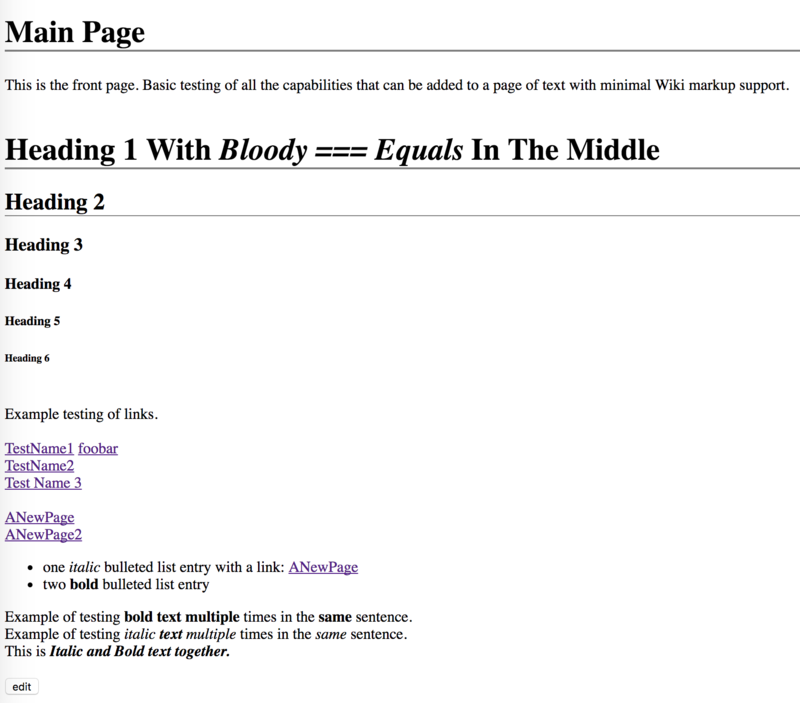 Basic testing of all the capabilities that can be added to a page of text with minimal Wiki markup support. Example of testing '''bold text multiple''' times in the '''same''' sentence. Example of testing ''italic '''text''' multiple'' times in the ''same'' sentence. And here’s what it looks like rendered in Chrome on a Macbook Pro. Handles links with [[ and ]] notation. Also handles spaces within a page link. Handles italic and bold text, and combinations of the two. Handles headings, from h1 to h6. Blank lines and lines that aren’t headings and part of an unordered list have a single HTML break appended to them. Other than that it’s just a way to organize text. I’m even writing a stripped down version that won’t allow you to edit any of the pages, for embedded read-only rendering.